Magical, heartbreaking, beautiful - Days of Wonder reminds us that stories have the power to save lives. Tom, single father to Hannah, is the manager of a tiny local theatre. On the same day each year, he and its colourful cast of part-time actors have staged a fantastical production just for his little girl, a moment of childhood wonder. But there is another reason for these annual shows: the very first followed Hannah's diagnosis with a heart condition. And now, with Hannah a funny, tough girl of fifteen, she must face up to that reality. With the theatre under threat of closure, Hannah and Tom have more than one fight on their hands to stop the stories ending. But maybe, just maybe, one final day of magic might just save them both. 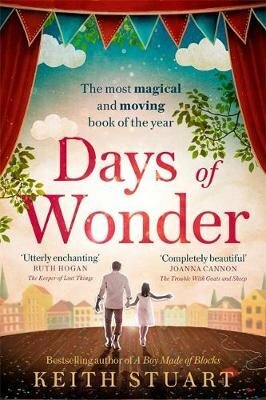 A tale about growing up, the beauty of a special bond between father and daughter, and finding magic in everyday life, Days of Wonder is the most moving novel you'll read all year.